We love this couple’s creativity! With the help of the staff at Esperanza and their event planner Claudia from Elena Damy, the bride and groom chose an unique dessert. 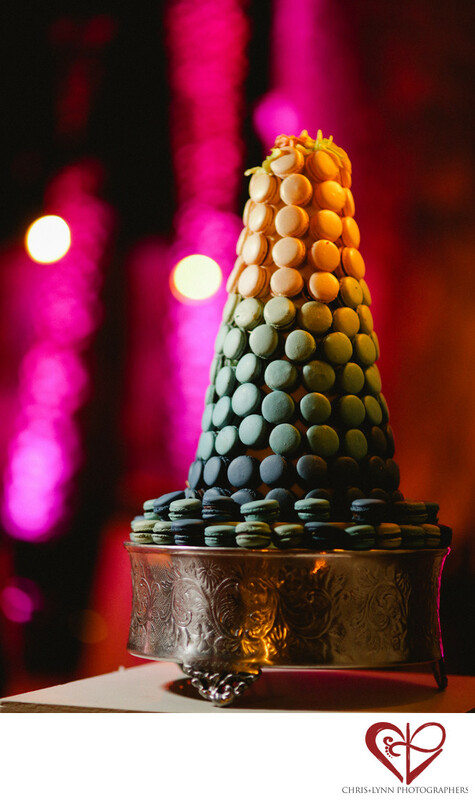 This towering cake of macaroons, ranging in colors from blue and green to orange, represents Erich and Erica’s love of Paris, France, where they got engaged! The cake sits atop a silver platter, waiting for the guests to finish dinner. The pink lights cast a romantic glow on the entire scene. As photographers, we love to see couple’s getting involved with the details of their wedding and choosing customized details to reflect their story as a couple. This incredible cake that was prepared by the Esperanza kitchen staff not only looked beautiful, but it was also delicious! The guests fell in love with the dessert as much as Erica and Erich had fallen in love with Paris. 1/125; f/1.4; ISO 1600; 85.0 mm.